It’s Opening Day of baseball season, which means there’s no better time than now to revisit a little Mets history. 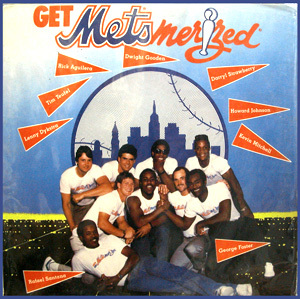 A record the 1986 Mets can be “proud” of. Most of the players had surprisingly little musical experience or talent. That, thankfully, didn’t stop them. George Foster – Perhaps George’s single greatest contribution to the 1986 World Series champs. “The Mets are better than the Red Machine.” YOU BET WE ARE, GEORGE. Sorry about that whole releasing-you-in-August-because-you-were-terrible thing. Howard Johnson – Simple, logical rhymes. Didn’t overthink it. Dwight Gooden – Was handed a soggy meatball by Straw’s lead-in (see below), but the line “Changeup, fastball, slider, curve/Step up to the plate if you’ve got the nerve” was the original rap challenge. Rick Aguilera – For the line “if you want a batter filled with terror, just call on me, Rick Aguilera!” Jay Z dreams he could write rhymes that hot. Kevin Mitchell – Starts out with so much potential (“I’m Kevin Mitchell, season’s rook/Studyin’ all the moves”) but then never actually gets around to rhyming it with anything. Lenny Dykstra – “It’s a wonder/I’m still alive!” Indeed, Lenny. Rafael Santana – There’s just nothing there. Sorry, Raffy. Tim Teufel – Oh, Timmy. Darryl Strawberry – I don’t even know where to begin. We love you, Darryl, but crikey, this is one of the most awful things ever recorded. His rhythm is off, nothing rhymes. “Power and speed, you know we got/We’re the beast of the East/When you’re hot, you’re hot/When Dwight is in the groove.” Wait, what?